Would Joseph Pilates do CrossFit? Many different people have tried to find their own niche in the world of Pilates, fusing with, or adding elements of other disciplines; or perhaps trying to make their classes specific preparation for another sport, or activity. (Yes, I have seen ‘bikinilates’ advertised). I think this may be missing the point, but more of that later. There are also signs that some teachers feel that Pilates is not enough in itself – that it needs to lead to something more – and I’d number myself amongst them. One of my teachers and trainers early in my Pilates career, James d’Silva, has created the Garuda Method, which was advertised at one stage along the lines of “where Pilates ends Garuda begins”. (One might debate the idea of Pilates ‘ending’ somewhere, I can imagine some sticklers for tradition and the original work rejecting the idea wholesale.) For me, CrossFit begins, not where Pilates ends, but overlapping, and happily coexisting. Perhaps this is the time to answer the ‘What is Crossfit?’ question. The answer is: “Constantly varied, high intensity, functional movement.” (…”Functional movements are universal motor recruitment patterns; they are performed in a wave of contraction from core to extremity; and they are compound movements -i.e. 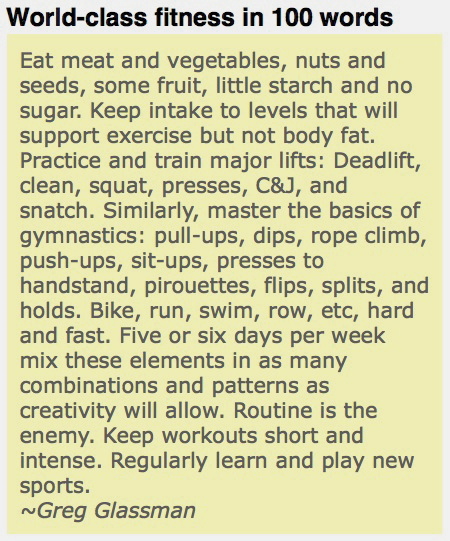 they are multi-joint.”), from ‘Understanding CrossFit’ by Greg Glassman. Greg Glassman is the creator of CrossFit and, like Joseph Pilates, a maverick figure with a solid conviction that what he is doing is valuable and should be disseminated as widely as possible. The strongest link that appears to me between the two disciplines is in the intended outcome. My understanding has always been (though I can’t find it in either of Pilates’ books, I’ve heard it from first generation teachers) that Pilates’ intention, after years of practicing a variety of different disciplines, was to create an exercise program that was non-specific. In other words, his exercises were for overall fitness, in readiness for whatever challenges life may bring. More recently the concept of GPP – general physical preparedness – has emerged, and this is central to CrossFit methodology. One trains a wide variety of activities in order to be prepared for as wide a variety of potential challenges as possible. Glassman seems to be fond of the idea of preparation, in as much as one can, for the “unknown and unknowable”. Many Pilates exercises involve maintaining a stable trunk (spine) whilst moving arms and/or legs. Typically the weight of the limbs and their movement act as a challenge to that stable trunk position. Similarly, one of the fundamentals of many CrossFit movements is ‘midline stabilisation’ – the idea that, particularly under load, you keep your trunk stiff, and move from your hip and shoulder joints. The only difference between the two is that Pilates doesn’t add load to the same degree. Had he been faced with current levels of osteoporosis, for instance, who’s to say that Joseph wouldn’t have favoured picking some weight up? 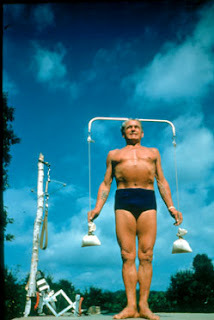 What else is there to lead me to the conclusion that Joseph Pilates would have embraced CrossFit? Followers of both methods will attest to the remarkable transformations in body composition, energy levels and overall well-being that are there for the taking. He didn’t seem to be interested in great analysis of his method: one of my favourite Pilates quotes (as recounted by Ron Fletcher) is, in response to a question about the purpose of an exercise, “It’s for the body!”. CrossFit celebrates becoming faster, stronger, more agile – and does not dwell on the exact mix of muscles required. Perhaps most significantly Joseph, tattooed as he was, would have fit right in with a great number of CrossFitters, for whom ‘ink’ seems de rigeur. I’m convinced that Joseph would have been involved in a movement like CrossFit, had he the chance. The truth is, while I couldn’t bring myself to give the post this heading, I believe (with apologies) that ‘CrossFit is the new Pilates’. 8 responses to Would Joseph Pilates do CrossFit? Great article. I think every Pilates teacher should read it. Great great post. I’ve been teaching Pilates, GYROTONIC for the past 16 years and a bodybuilder and trainer for 9 years before that. I was introduced to CF by my amazing sister in Denver December 2011… and haven’t looked back since. I think Joseph would be a massive fan of CrossFit and I see no conflict between the two. In fact I have a great relationship with the owners at my box and we regularly share clients. Thanks Neil, I really appreciate your feedback. I understand the desire to do crossfit. It’s intense, uplifting, and can get you some degree of fitness. I trained for 4 years with a power lifter and for 8 years as an oly style lifter. Crossfit does not teach technique. It’s reps for speed, not for weight and not with good form. Crossfitters I knew were constantly using their injuries as excuses to not show up for lifting. Very few Pilates teachers get injured doing Pilates. And it’s not a competition! Pilates is about you, yourself, and your body. Being strong, flexible, and dynamically fit is a good thing. Pilates allows you to get strong without bulking up or burning out. Works for me. Thanks for reading, Tracy. I agree with what you say about Pilates, however my CrossFit coaching friends would disagree with you about technique/form. Just like Pilates, in CrossFit there are bound to be good, and not so good coaches. I could introduce you to a good few Pilates teachers who are neither very strong nor injury free. So how will you explain the number of CrossFitters who in 20 years will be turning to Pilates because they’ve injured themselves so greatly they can no longer continue CrossFit after wrecking their hips, knees, and shoulders? Have you actually been to a CrossFit gym? Precision is not one of the principles of the WOD. I know some CrossFitters and they are riddled with injury after injury. I dare say Mr. Pilates would NOT endorse CrossFit. Hi Sharon, I’m delighted to have provided a forum for you to express your views. Yes, I’ve been to a CrossFit gym. And I’ve done the CrossFit level 1 certification. I’m not blind to the shortcomings of the business, or some of the coaches that they certify, but I guarantee you that TEACHING during a WOD is a lot harder than teaching a Pilates class. So please don’t declare what is or is not a part of CrossFit, because you manifestly don’t know – in just the same way that someone who tries one or two classes probably wouldn’t have much insight into Pilates. I will probably explain the people turning to Pilates after injuring themselves in CF in much the same way I’d explain the people, teachers and otherwise, that I know who have been doing Pilates for years and STILL get injured. And are too weak to manage their own body weight, too. PS Do you know any runners? Do they have injuries, by any chance?